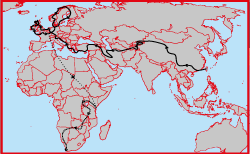 This map shows exactly where we traveled and is continuously updated. At the moment we are in Europe. We cycled 32,000 km so far, not counting other methods of transportation.